Anti Black Coat is a nightmare whereas Red Eyes is a heartless, so they aren't the same. The theory about Anti Black Coat appearing because of Aqua's encounter with Red Eyes playing through Sora's dreams is pretty interesting but nevertheless unlikely. The Anti-Black Coat track (The Dread Of Night) uses Hand in Hand/Hand to Hand as base (listen to the horn), I guess because that track is use to symbolise the friendship, whereas Hunter of the Dark seems to be based around the world of darkness (and I think dearly beloved). Hey I'm just saying Red Eyes is definitely a heartless whereas Anti Black Coat is a Nightmare, it's not impossible that they're connected I'm just saying unlikely! Your theory is interesting. Btw the heartless has a name, it is "Dark Hide". you sure i never heard that name before? ok so this theory proof red eyes and anti black are connected that seals it right? really? they went with dark hide? I was betting money the official name would be "red eyes black heartless" and that it would have a blue eyed white nobody. Red eyes is technically incorrect as the eyes aren't really red, just have that aura glowing around them from time-to-time and I believe Dark Thorn was already taken. 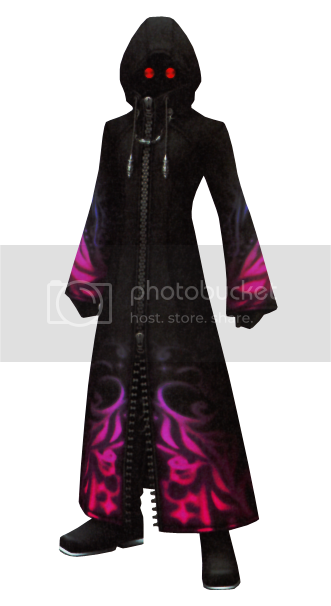 — Riku fights a Nightmare wearing a black coat in this world, just who was that? Nomura: That Nightmare was the personification of the nightmare Sora was having. Listening to the themes is pointless. The similarities mean nothing because Nomura has told what the anti-coat was bluntly. It was Sora's nightmare and it was subsequently destroyed. It's honestly just that simple. His words aren't magical, there's no need to be that way. He's the top brass on the series so naturally anything he says is, is unless he changes or contradicts it later either in word or the games.